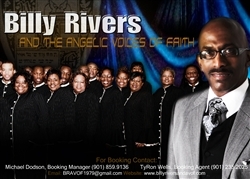 The Fresh Music Page: Something for the Traditional Gospel Music Lovers: Billy Rivers & The Angelic Voices of Faith "Waymaker"
Something for the Traditional Gospel Music Lovers: Billy Rivers & The Angelic Voices of Faith "Waymaker"
Watch as Billy Rivers & The Angelic Voices of Faith tear up a church singing"Waymaker ". They having church up in there! Look to the right, they only have 3 soprano's and they are holding their own. This is the type of music I'm use to in a church.